Rory McIlroy has picked up the European Tour Golfer of the Year award for the third time in four years. The 26-year-old from Northern Ireland enjoyed three tour victories in 2015 to win the Race to Dubai title ahead of Englishman Danny Willett. 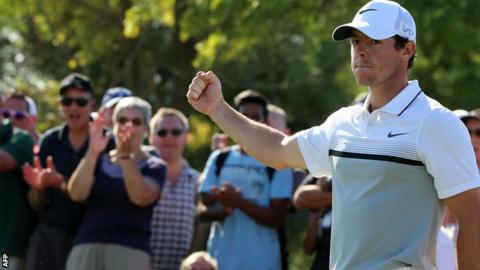 McIlroy triumphed despite an ankle injury which ruled him out of action for five weeks. "I feel very proud to have won for a third time - it's always special to be recognised in this way," said McIlroy. The world number three secured his first tour victory of 2015 at the Dubai Desert Classic, followed by success in the WGC-Cadillac Match Play in San Francisco in May. Victory in the season-ending World Tour Championship last month ensured McIlroy also won the Race to Dubai title for a third time in four years. "After a good first half to the season, the injury was obviously a setback for me, so to finish the year strongly with my second victory in Dubai, plus picking up the Race to Dubai title again, was very satisfying," added the four-times major winner. "This was an objective I successfully fulfilled this season. To now also win the Golfer of the Year award is a great way to sign off the year.